The Gray Report: W. Blake Gray shortlisted for another Roederer Award! W. Blake Gray shortlisted for another Roederer Award! 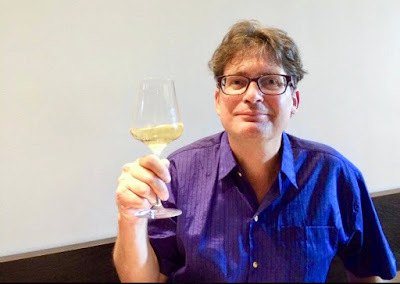 One of my proudest achievements in wine writing is winning the Roederer Award in 2013 for Best Blogger/Online Wine Writer. It's still right there in my blog's masthead. The night I won, while my wife and I were deeply into a bottle of sparkling wine, she suggested that I put the award on my business cards. That sounded like a fine idea. I went right to a design-your-own site, downloaded a generic photo of wine grapes as art, and ordered a batch. I thought the minimum order was excessive: 1000 cards, for a business card I could only use for a year until somebody else won the award. But what the hell, I figured: the night before the next person won, I could just stand in the street and hand them out. However, I got unbelievably lucky. They renamed the award! It's now called the Ramos Pinto Online Communicator Award. This is not just a renaming: it's a new category, right? This is my logic as, five years later, I still use those drunkenly composed business cards. I have been resting on my laurels, but this year, my editor at Wine-Searcher, Don Kavanagh, urged me to apply for Best Online Communicator. He has to read all my stories for that site and he thought I had a good year. Last week I learned I made the shortlist! It's an extremely intimidating group, and I'm glad that, as my friend Alder Yarrow pointed out, it's not the Roederer Award for Wine Knowledge. That is some serious company. I'm delighted, honored and humbled to be included. I don't know if I'm going to win, but I'm proud of that work. I hope you'll excuse the lack of humility in this post. I'm just so pleased to have a shot at this award -- even though it would probably mean I would have to order new business cards. Congratulations, Blake. The three articles that you submitted were all well-considered, well-written, and, well, worthy of nomination. I'll be rooting for you. You do a great job of writing wine based articles that make people think. Bravo..
W. Blake Grey is the best - at wine writing and in the choice of fashion eye wear! Good great luck, glad to see the breakfast wine piece was one of the submissions!